Kitchen gadgets help us do so many more things while cooking at half the time and are really so much fun! But paying for them is not something we all want to do! Some are super expensive. Winning the latest kitchen gadgets is fun and free! 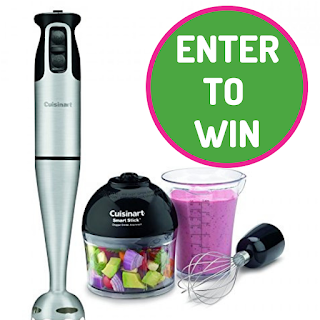 Here is your chance to win yourself a Cuisinart Smart Stick Hand Blender valued at $110. You can enter 2x a day per email address which increases your chances of winning. The Cuisinart Smart Stick Hand Blender giveaway will be running until October 25, 2018.